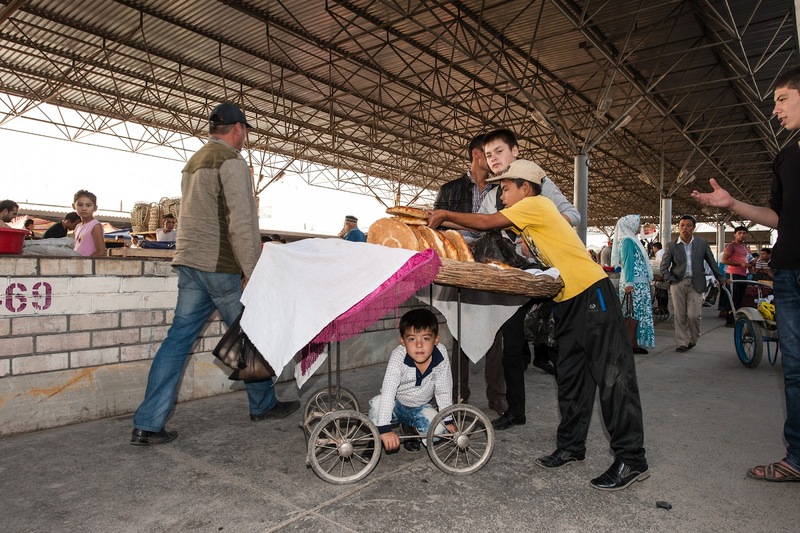 On the second day, we began the long car journey to Ferghana Valley. 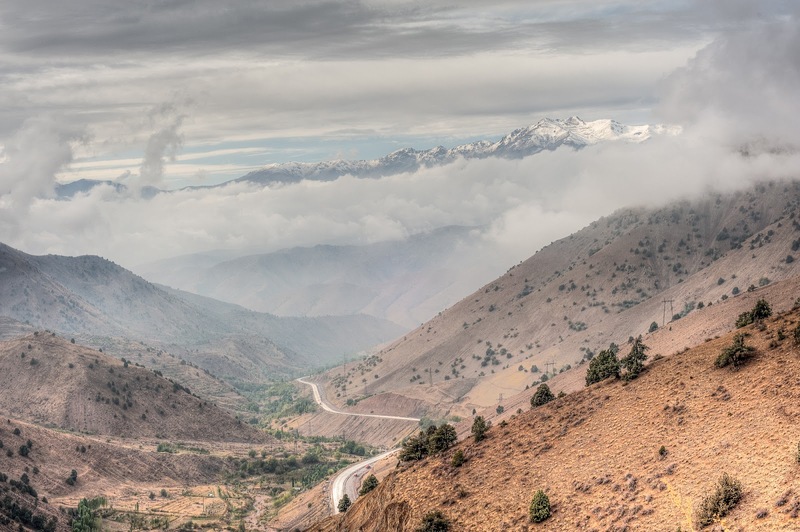 The Ferghana Valley is about five hours almost due east and slightly south of Tashkent. Originally, we were to fly to Ferghana, but because Uzbek Airlines changed the flight to sometime in the middle of the night, most travelers are forced to make the drive instead. The road to Ferghana is narrow and over the 2268 meter/7450 foot Kamchik Pass in the Tian Shan mountain range. To minimize accidents, the Uzbek government now prohibits "large" vehicles like minivans and trucks from using the road. We made the journey in a 4-seat sedan. If the group is large, then the tour company must caravan with four persons in each car. On one side of the pass, we stopped for a restroom break and a somsa (samosa). 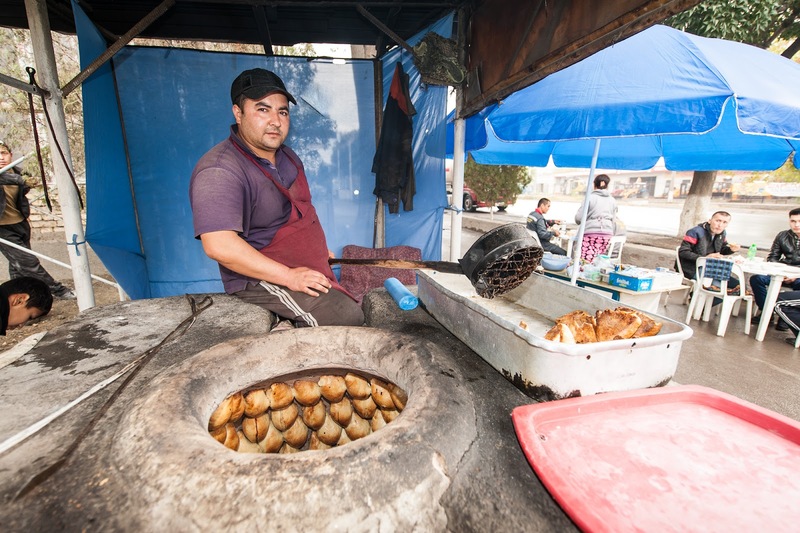 The pastries filled with onions and meat are stuck to the side of the hot oven and plucked off when they are brown. So delicious! The Ferghana Valley is the most fertile part of Uzbekistan, and agriculture reigns here. We noticed the many small plots of land were bordered by poplar trees. 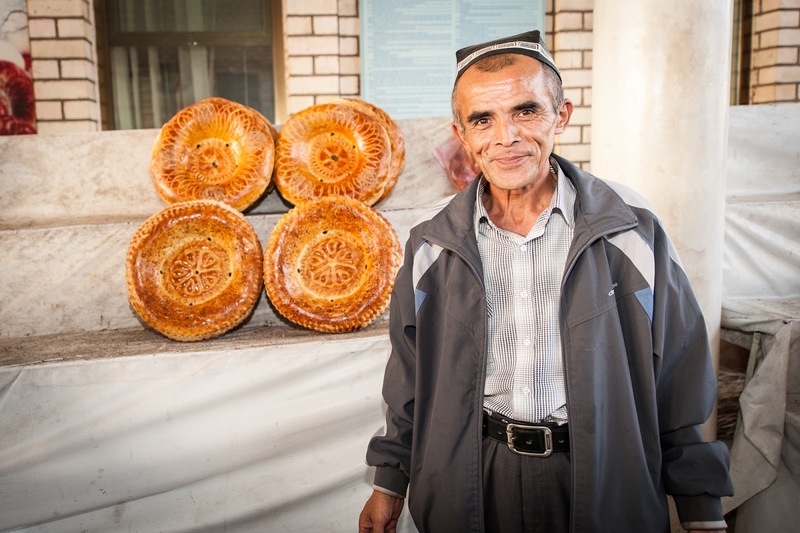 Azat told us that when a boy is born, the custom here is to plant 40 poplar trees. When the boy reaches 18 or so and marries, the trees are used to build a house for the son and his new wife. When a girl marries, she leaves her home to move in with the boy's family so that kind of advance planning is unnecessary for the birth of a girl. In the Ferghana Valley and the city of Rishton produces fine ceramics and Margilon is renowned for silk textiles. Our first stop was at the workshop of Rustam Usmanov. Our guide, Azat, arranged for us to have our lunch in Usmanov's peaceful garden surrounded by his beautiful blue and green glazed plates. The next morning, we were off to Margilon to watch the process of making silk ikat. For me, this is the real "silk road." In the first century AD, traders brought silk and spices from China to the "west." Beginning in about the 9th century AD, fine silk could be obtained from Margilon. 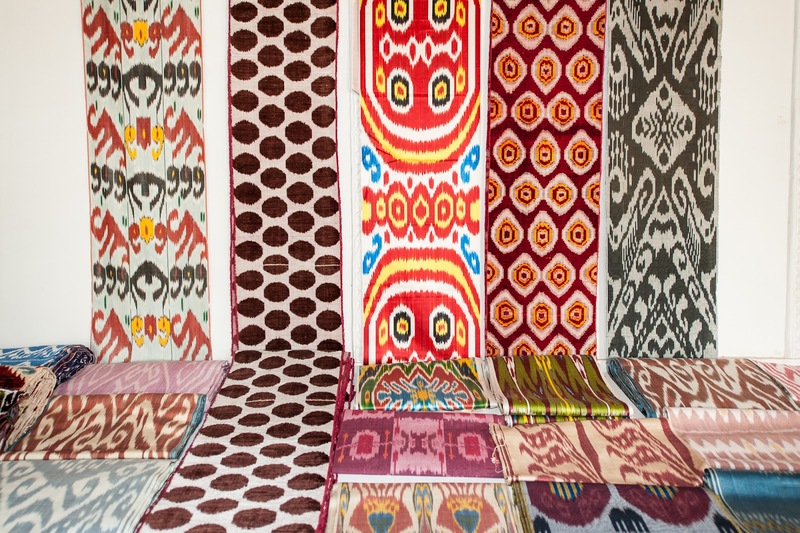 The aber-band technique is still used today to create ikat textiles in either all silk or part silk/part cotton. The patterns are amazing and limited only by the designer's imagination. The more colors there are in a design, the more expensive the textile. When we arrived at the workshop of Rusuljon, they were in the process of dying silk. At this workshop, they use only natural dyes. This particular shade of saffron yellow was created with a combination of pomegranate and onion skins. Interestingly, the Uzbekistan government has classified Rusuljon as an artist of traditional arts meaning that his income is tax free. The threads of silk have been banded with scotch tape to block the dye in some areas of the design. 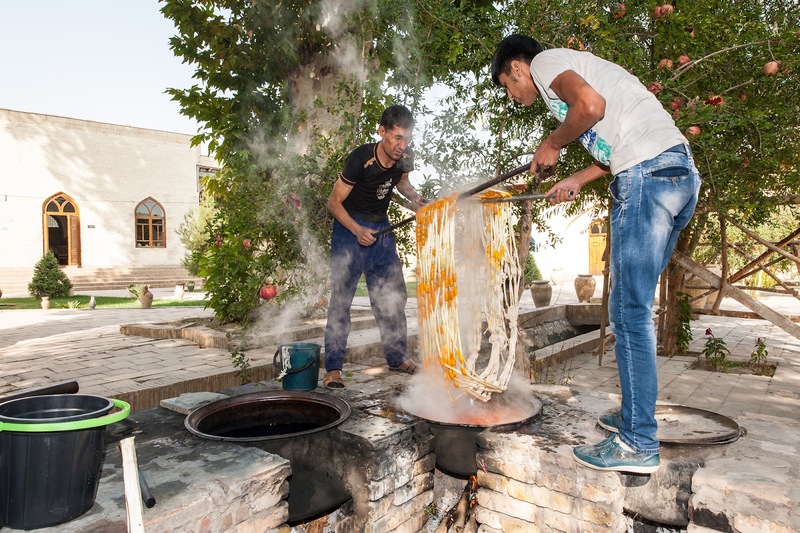 Once the dye has been completely absorbed into the unprotected areas of the silk threads, the threads are wrung out and then rinsed in running water. After purchasing some silk and silk/cotton pieces from Rusuljon's workshop, we visited Yodgorlik Silk Weaving Workshop, a commercial enterprise, where we watched the many steps that must be taken prior to getting to the dying stage. First, the cocoons are boiled. Then the silk threads must be separated from the cocoons and loaded onto a spinning wheel. The raw silk threads are washed. Eventually, the silk threads are separated into bundles. The bundles of threads are stretched on a two-meter frame where the pattern is then painstakingly marked and bundles of threads are banded with tape. This stage of the process is repeated each time a new color is added. Once the dying is finished, the warp threads go to the weavers. 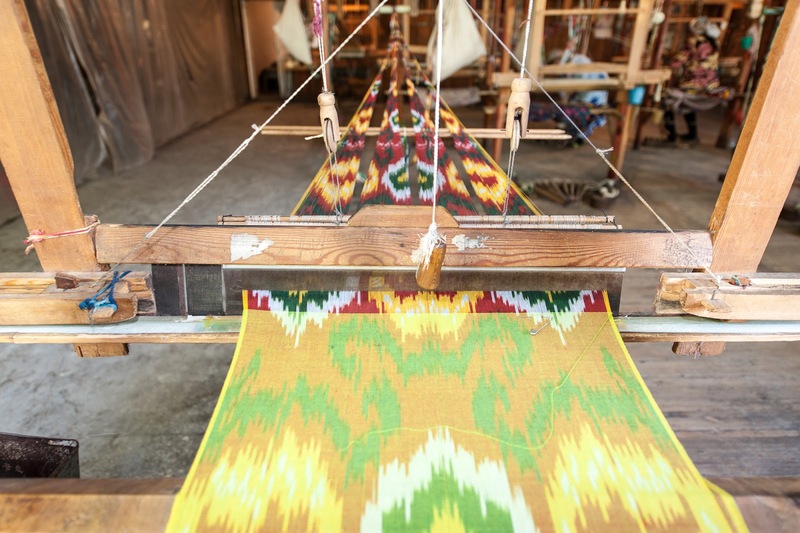 The process of adding the patterned warp to the loom will take hours. Many households in Margilon raise silk worms in their homes. Silk worm larvae can only be purchased from the Ministry of Silk. The larvae develop into worms that gorge themselves on the leaves of the white mulberry tree eventually retiring to their cocoons. At that point, the cocoons are frozen to kill the worm and preserve the silk. It is illegal to export any portion of a silk cocoon. Leaving the silk workshops behind, we made a short stop at the very clean Margilon market. The next day we returned to Tashkent. It was EID and in Tashkent the only evidence we saw of the "Sacrifice of Abraham" was goat/sheep skins heaped up at several street corners. Tomorrow we continue along the Silk Road with a drive to Samarkand.